Henry Purcell, composer, organist and singer (bass and countertenor), was born in England in 1659 and died on November 21, 1695 in London, England. While German-born composer George Frederic Handel (1685-1759) is the most famous English composer of the late part of the Baroque Period in music (1600-1750), Purcell is the most famous English composer of the earlier part; he is buried in Westminster Abbey. Purcell lived during the English Restoration, which began in 1660 when Charles II was restored to the throne of England following the Commonwealth and Protectorate period (1649-1660), which had begun with the execution of Charles II’s father, Charles I.
Purcell became organist at Westminister Abbey in 1679 and composed music for and played at the coronations of James II (1685) and William III (1689), as well as the funeral of Queen Mary (1694). AIR is synonymous with tune or song, and was often spelled ayre in the 17th Century. 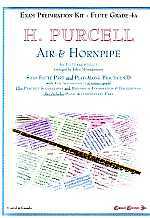 HORNPIPE is a lively dance similar to a Jig. Both have been arranged for Solo Flute with Strings.